The mighty French Broad River starts as a small stream high in the North Carolina mountains and flows 200+ miles to Knoxville to help form the Tennessee River. It's the third oldest river in the world, even older than our mountains (formed some 300 million years ago)! Since it runs through the center of Asheville and the surrounding national forests, there are plenty of ways to enjoy it - including camping, hiking and biking along the shores or paddling on a kayak, canoe or paddleboard. There are many parks along the way with access points for fishing, bird watching, picnics and more. While the river is fairly flat through the city of Asheville (perfect for tubing and float trips), you'll find big rapids north in Madison County - a great place for whitewater rafting and kayaking! Waterfall Trio: On the North Fork of the French Broad (that merges with the west fork at Rosman) along Highway 215, find three waterfalls near the roadside: French Broad, Shoal Creek and Cathedral Falls. Read more about these waterfalls. A short hike connects them. Read about these waterfalls. Lazy Otter Outfitters: Henderson County's only paddle outfitter is located south of Asheville at the base of the Horse Shoe Bend. 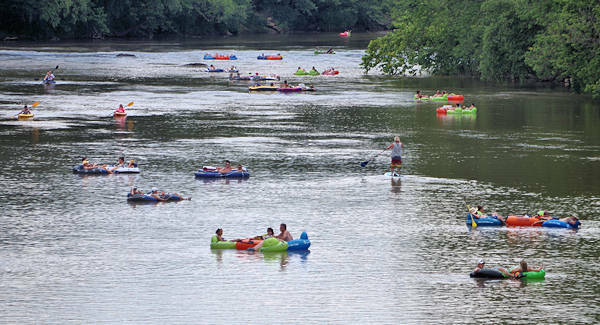 Explore one of the prettiest stretches of the French Broad via tubes, kayaks and canoes. One trip ends near the Sierra Nevada Brewery. Go to their website. Fly Fishing: Take a guided float boat trip down the river with a fishing guide to catch some trophy trout and bass. Beginners are welcome for this relaxing day on the water! Southern Appalachian Anglers will supply all equipment (including waders if you want) and plenty of expertise! Read more. The tubing parade on a lazy, hot summer day. French Broad River Outfitters: Located near downtown Asheville with three locations, rent a paddle board, kayak, canoe or tube for a river adventure. Also, rent camping gear and book multi-day trips down the river. Read all about them. Asheville Outdoor Center: Hit the easy button and find your equipment, shuttles and expert guidance at this one-stop shop. They will shuttle you up the river, and you'll end your trip at their riverside campus. Kayak, canoe, tube or paddleboard. Grab a beer at their taproom afterward! Read more about their many options. Do-It-Yourself River Paddling: If you have your own kayak or canoe, along with two vehicles for shuttling, you can paddle seven miles through Biltmore Estate with the help of two river parks. Start your journey at Bent Creek River Park (1592 Brevard Road) and end at Hominy Creek River Park (104 Hominy Creek Road). 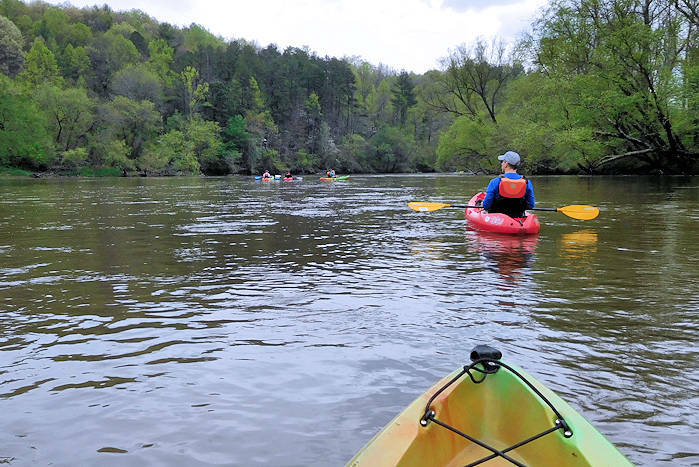 Or rent a kayak, canoe, paddleboard or raft and one of Asheville's outfitters will shuttle you up river for a self-guided trip down the river to their locations. 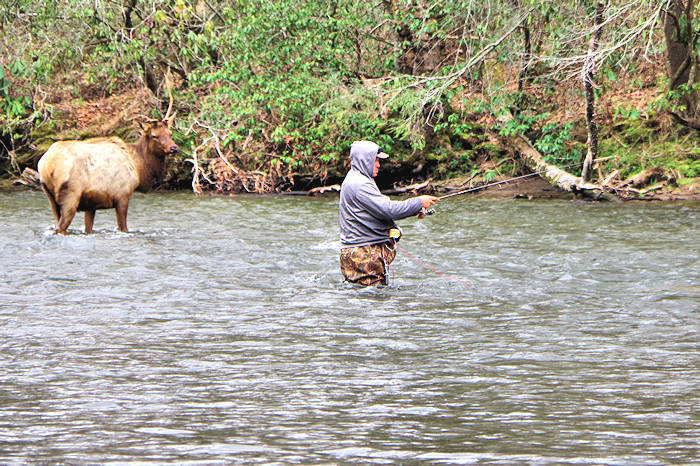 Read about the French Broad River Trip. French Broad River Park System: The city of Asheville has three adjacent riverside parks: Carrier Park, Amboy Road Park and French Broad River Park. Read more about these city parks. Carrier Park (220 Amboy Road) offers a variety of impressive recreational facilities. The French Broad River Greenway follows the riverside. The most unique feature is the velodrome, a former racetrack that is now used by bicyclists. Inside the velodrome, find basketball courts, a playground, inline hockey rink and volleyball courts. Other features are a lawn-bowling green, big picnic pavilion and walking nature trail. A sidewalk connects to Amboy Road Park, a riverside greenspace. The French Broad River Park (508 Riverview Drive) has a greenway, river overlook, half-mile trail and the popular dog park. French Broad River Greenway, a 2.8-mile riverside paved trail, connects all the parks. 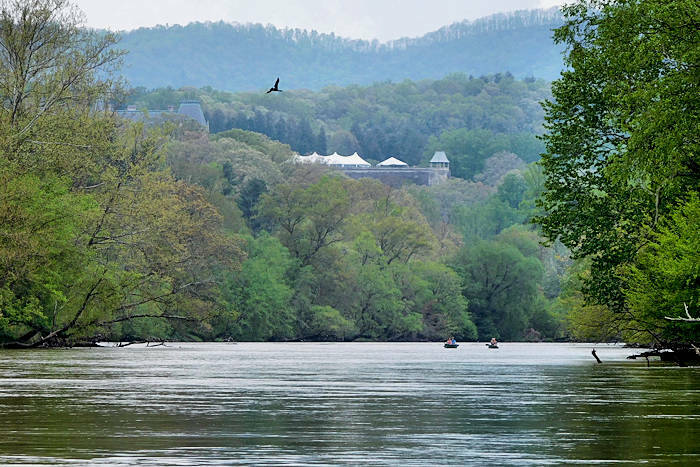 Biltmore Estate: Biltmore's Outdoor Adventure Center offers peaceful float trips down the gentle section of French Broad River through the Estate. Paddle with your guide in a raft or get in a single or tandem kayak for a self-guided trip. All trips depart from Antler Hill Village inside the Estate, so admission tickets are required. Trips offered April-October. 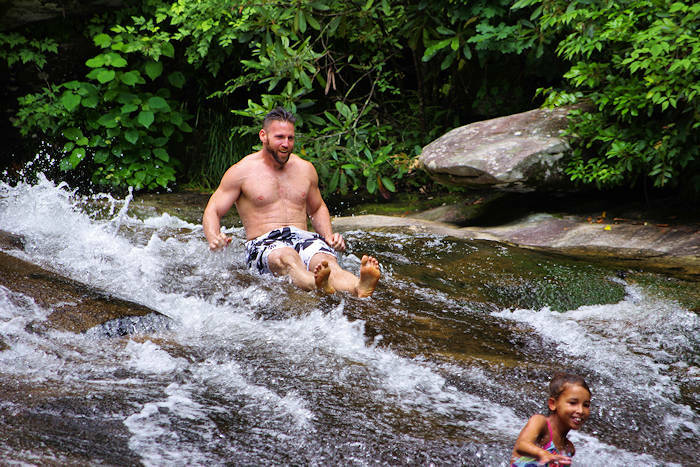 Read more about river fun at Biltmore. River Arts District: Visit the many artists that have studios in converted warehouses and industrial buildings along the river, just a few miles from downtown. Read all about the River Arts District. 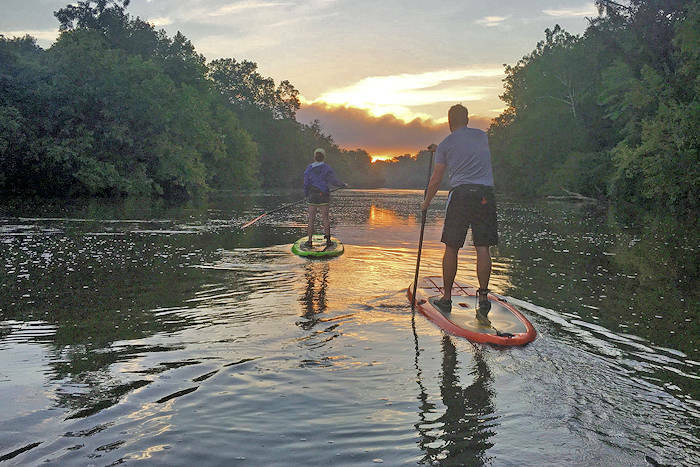 Stand-Up Paddleboards: Wai Mauna SUP Tours will teach you the basics to enjoy a 4- or 7-mile guided river paddle downstream through Biltmore and Asheville. All of their guides are certified SUP instructors. Their boards are wide and stable. In Hawaiian, the name "Wai Mauna" translates as "mountain water." Go to their website. New Belgium Brewery: Tour the amazing brewery and sample beers while watching the action on the river. Walk or bike the new riverside greenway. Read more! 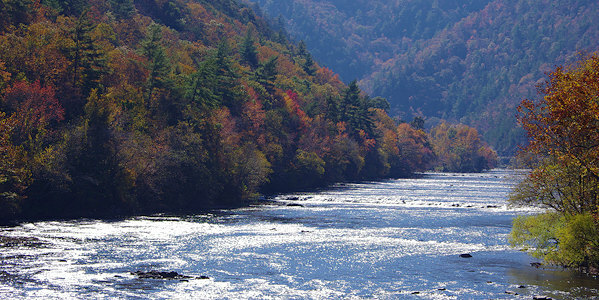 French Broad Overview NC Scenic Byway: Drive NC Highway 251 to three riverside parks. This 17-mile Byway starts north of Asheville at I-26 at Exit 19. Take U.S. 25/70 toward Marshall and turn left at the first stoplight onto Monticello Road. Go three miles to N.C. Highway 251. Turn right and drive along the French Broad River to Marshall and Madison County. Ledges Whitewater Park (1080 Old Marshall Highway, Alexander): Watch paddlers practice in the rapids here or bring your kayak to build some skills. This two-acre park has grills. Alexander River Park (250 Old Marshall Highway, Alexander) has a one-mile walking trail and picnic tables. Walnut Island River Park (3042 Old Marshall Highway, Alexander) also have picnic tables and boat launch. Marshall: Visit Blannahassett Island, home to a city park and the Marshall High Studios, a historic high school that is now home to many artists in 28 studios. Find picnic areas, walking paths, a fishing pier, a disc golf practice field and outdoor stage for concerts. Read all about Marshall. Whitewater Rafting: Take a rafting trip, half-day of five miles with Class II-III rapids or a full-day trip with eight miles that adds Class IV Frank Bell's. It's family-friendly with no experience required. All trips are guided through a very scenic section through the Pisgah National Forest. Learn a little history and see wildlife. It's only 30 minutes drive from Asheville. See our Whitewater Rafting Guide. Hot Springs: The Appalachian Trail crosses the French Broad River here at the famous hot mineral water springs. Take a soak or hike from downtown Hot Springs to Lover's Leap for great views of the river. Read all about Hot Springs. Conservation: Southern Appalachian Highlands Conservancy protects headwaters and streams that flow into the French Broad River. Protecting undeveloped farms and forests throughout the watershed helps protect water quality. Read more about them. French Broad River Paddle Trail: Explore the river and find campsites along 117 miles, spaced about 8-10 miles apart. Read more.